A new supercar was unveiled at the North American International Auto Show in Detroit. Called the Force 1, it shares the 555 kW/928 Nm 8.4 liter V10 of the Dodge Viper. This new car has been designed by Henrik Fisker, who has used his new company VLF Automotive, focusing on sports cars with large-capacity naturally aspirated petrol engines, and the Dodge Viper is certainly one of those! 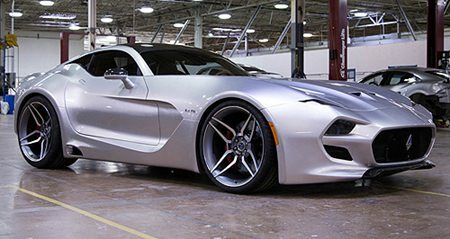 VLF was founded by Fisker, and involves former General Motors vice chairman Bob Lutz and manufacturing authority Gilbert Villarreal. The company title borrows the initial of each founder member’s surname. With a $US300,000 price tag the Force 1 goes up against the far cheaper Chevrolet Corvette Z06, Spyker C8, Aston Martin Vanquish and the Viper with which it shares an engine, but VLF says its latest creation delivers “the best performance in its price class”. With the use of extensive carbon-fibre construction this has kept weight to about the 1500 kg giving zero to 100 clicks in 3.0 seconds and on to a top speed of 351 km/h, but still provides a “luxurious contemporary interior for two people”, say VLF. Transmission is either six speed manual or six speed auto. The Fisker-style body is a head turner with large air intakes at the front, a couple of NACA ducts at the leading edge of the bonnet and Ultra Thin Ventilated (UTV) tail-lights and slender peeping headlights not unlike the Mazda MX-5. Wheel size is at the edge of extreme at 21 inches with Pirelli P Zero rubber and the car’s dimensions are 1243 mm high with a 2018 mm width and 4545mm length. Fisker had previously founded Henrik Fisker Design, which produced a number of concept vehicles but has not resulted in a confirmed production model. The Fisker Karma belongs to the Chinese parts-maker Wanxiang, which bought Fisker’s company in 2014. The ASEAN Economic Community (AEC) is now upon us, and if you think that will sparkle up the auto industry, you are a born optimist. Ford’s new ASEAN President Mark Kaufmann does not have the same optimism and is predicting a 6 percent fall in vehicle production for 2016 for the region. There are many factors involved here. Malaysia introduced a 6 percent GST, Thailand has a new excise tax based on CO2 emissions, decreasing overseas investment, a credit squeeze and the carry-over from artificially inflated demand brought out by the first car buyers scheme, producing an extreme slow-down when the scheme ended. In 2014 regional sales dropped 10 percent, with Thailand the biggest loser on a 34 percent drop. In 2015 the negatives outweighed the positives, so that although Vietnam and the Philippines showed an upwards sales movement, their entire auto industry was still small, and with Thailand’s sales being again so low, along with Malaysia, Indonesia and Brunei, these factors have produced the outlook of a further fall of 6 percent. Quite frankly, if the member countries in the AEC don’t apply themselves to this problem, China will take over as the manufacturing hub for ASEAN. China has the capacity and has been importing technical assistance. How does it work? The Safety Truck consists of a wireless camera attached to the front of the truck, which is connected to a video wall made out of four exterior monitors located on the back of the truck. The monitors give drivers behind the truck a view of what is going on ahead of the truck, even in the dark of night. This allows drivers to have a better view when deciding whether it is safe to overtake. Another advantage of the Safety Truck is that it may reduce the risk of accidents caused by sudden braking or animals crossing the road. Samsung has been able to confirm that the technology works and that this idea can definitely save the lives of many people. This technology works, but what price for the four exterior monitors? And what’s the chance of their being stolen? Despite Thailand having (almost) the worst road toll in the world, the deaths on the road didn’t start here. There was little more than a handful of petrol cars in Britain when Bridget Driscoll, 44, took a trip to the Crystal Palace, south-east London, on 17 August 1896. She could be forgiven for being bewildered by Arthur Edsall’s imported Roger-Benz which was part of a motoring exhibition taking place as she attended a Catholic League of the Cross fete with her 16 year-old daughter, May, and a friend. At the inquest, Florence Ashmore, a domestic servant, gave evidence that the car went at a ‘tremendous pace’, like a fire engine – ‘as fast as a good horse could gallop’. On the other side, the driver, working for the Anglo-French Motor Co, said that he was doing 4 mph when he killed Mrs Driscoll and that he had rung his bell and shouted. One of Mr Edsall’s two passengers during the exhibition ride, Ellen Standing, told the inquest she heard the driver shout “stand back” and then the car swerved. Mrs Driscoll had hesitated in front of the car and seemed “bewildered” before being hit, the inquest heard. Edsall had been driving only three weeks at the time and - with no license requirement - had been given no instruction as to which side of the road to keep to (very similar to some of the drivers in Pattaya). With conflicting reports about the speed and manner of Mr Edsall’s driving, the jury returned an accidental death verdict. Nonetheless, the National Motor Museum’s libraries officer Patrick Collins admits there was “quite a lot of anti-car feeling” in the UK at the time. “A lot of people didn’t want drivers running around the country scaring horses,” he explained, adding that there were fewer than 20 petrol cars in Britain at the time. These first cars were subject to strict safety laws which had been designed for steam locomotives weighing up to 12 tonnes. Each vehicle was expected to have a team of three in control; the driver, the fireman - to stoke the engine - and the flagman, whose job was to walk 60 yards in front waving a red flag to warn horse-drawn traffic of the machine’s approach. The flag requirement was ditched in 1865 and the walking distance reduced to 20 yards, although speed limits of 2 mph in towns and 4 mph in the country remained in place. Mrs Driscoll died just a few weeks after a new Parliamentary act - designed for the new and lighter petrol, electricity and steam-driven cars - raised the speed limit to 14 mph, while the flagman role was scrapped altogether. The coroner told her inquest that he hoped hers would be the last death in this sort of accident. Little did he know how times would change over the following century, with the Royal Society for the Prevention of Accidents estimating more than 550,000 people have been killed on Britain’s roads since then (and Thailand’s road traffic accident experience is even worse). Last week I asked what was the first motor car to be designed and built as a complete engineering entity, rather than cobbled together with odd bits and pieces. Clue, it was built in 1895, though production models were not made until 1900. It was one of the first cars where a part could be fitted to all the cars of that model. This was a technique that came from gun production! The answer was Lanchester. Cadillac and Ford were much later. So to this week. “Knock knock!” who’s there? “Harry”. What is the significance to this? What is the Haas F1 team? The greatest driver of all time? And if you manufacture in America?